Onde Screen Rulers is an accurate virtual screen rulers on Mac, by which you can measure dimensions of objects in Pixels, Inches, Picas, Centimeters and calibrated units. In addition, a built-in protractor can measure angles in angles and radians. 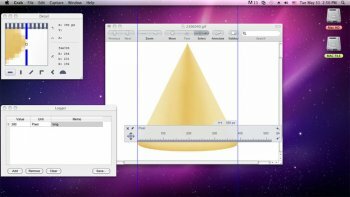 With intuitive features, Main Futures: *Quickly and easily measure the length and width of any object in pixels, inches, picas, centimeters, angles, radians and some other units customized on your Mac. *Measure angles using the built-in protractor.